Remarkable Home Interior Design - A Favorite Stop for Home Decor & Interior Design Since Opening in 2002. Susan Bayer-Fishman has spent her life working to bring enjoyment and wonder to everyday spaces. 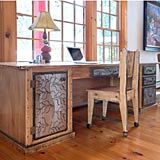 This life's passion formally began with the founding of an architectural stained glass studio and continues today with her retail galleries in Stowe, Vermont. To fill her critically acclaimed galleries, Susan has always sought to find the finest crafted and most extraordinary treasures. Her eye for the remarkable means that everyday objects become instant family heirlooms. Distinctive quality, joy and unexpected details have always defined her aesthetic. Through her work in the galleries, Susan discovered her love of helping clients uncover their visual selves. This enthusiasm has evolved through the years into a busy interior design services business. Susan loves remarkable things and she gives her clients the confidence to love, seek out and live with them too.